This project was my application to the recently finished Blender-Pt ( http://forum.blender-pt.com/ ) forum contest. We have a traditional/popular everyman character called Ze Povinho, much like the American John Doe, ( http://en.wikipedia.org/wiki/Z%C3%A9_Povinho ) and the purpose of the contest was to model our own version of him. I chose to portray a retro-future Ze, repairing his mech war robot after some battle. 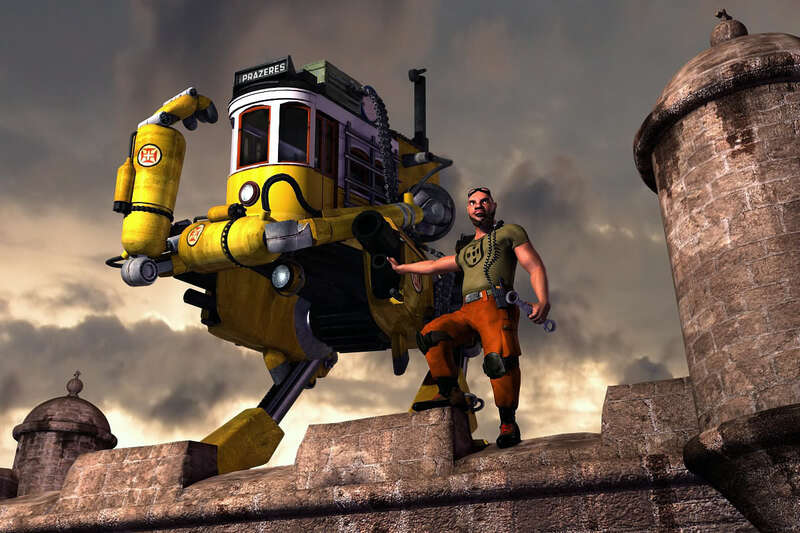 The robot is shaped after a traditional Lisbon Tram car, or “Lisbon Electrico” and both sit atop a portuguese colonial fortress much like the ones spread across Africa, South america and the Far East. I had some deep rust to remove from my Blender skills, and this project involved most of them (model, Subs, UV, rigs etc.). Here are some pics of the process and the final image (it won :yes: !). Ze textured and rigged, still some errors with the bones weight painting and some seams on the UV. Oh you definitely deserved a prize for this - excellent image, I do like the concept of the robot a lot. It is quite funny with the tram merged into the rest of the mechanical body. Also, nice textures and renderings (where they all done in Blender’s Internal Engine?). So yeah, there’s not much to say - although the textures of the castle in the final image are somewhat fuzzy, that is not even worth mentioning. Good job and congratulations! 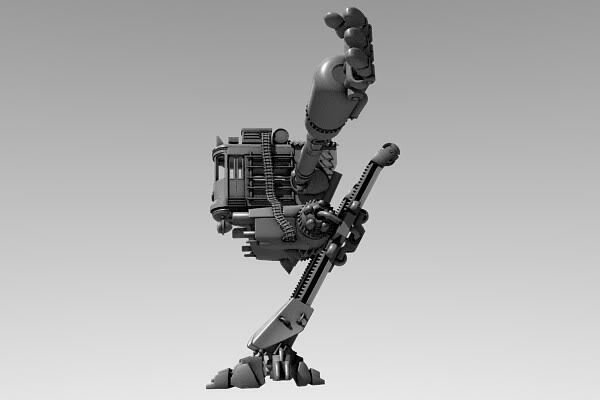 Haha, I haven’t seen a robot in such pose! Very good modeling, and texturing! How long it took you to finish this project? I think he image is a little unflattering for the good work you’ve put into this it feels a bit like “heres the foreground and there’s a picture of the sky behind it”. So the robot and guy, very good, the scene i’m not so sure about. All renderings on Blender Internal, the background on the mech test renders are from the Sunsky tex plugin. Well I was working on this on and off for about a month, although the last couple of weeks I was away on vacations (with my laptop…) and progress was slower. lol very fun composition . wow, now that’s some modeling and rigging! I love the mech!!! Some of the more funny poses I have seen from a robot. I’m not too fond of the textures on Ze though, the head is nice, the rest of the textures are just so-so. You did such a nice job modeling him, but the textures lower the quality of him. IMHO. Awesome character and design ! Congratulations ! The modelling and texturing is just amazing. But I agree with Marcus, the final scene could be a bit better. Maybe it’s missing some post-pro effects to give it more action feeling… I’m not sure what exactly. I like more the concept sketch it is more funny, maybe you make a cartoon version. The pose in the concept drawing it is perfect maybe you reconsider it. Overall hard work but the final render do not have the sparkle that the sketch has. Yeah, it’s a little unfortunate, the actual models and everything look great, and I was really working up to be knocked over by the finished version, but it just doesn’t have quite the punch. would say the same. It looks perfect, but you can squeeze much more from the result. more atmospere(some particles? ), postpro effects?, more contrasted lightning, and more relaxed poses. awesome modeling and character design! good texturing. however, the final scene doesnt do them justice at all. the pose angle and focus are weak, and the lighting doesnt do anything for it. if it were a frame from an animation itd be ok, but as a still it looks badly composed. good job, though. keep it up! i like the robot and all, but how does the guy get inside it? the tram doors are much too small for him to fit into. does he climb in the top, or does the robot not need a pilot? You guys are right, the contest is done, but I must re-use this material and get a stronger scene, and the poses could relax a bit too. Originally wanted an “epic” look, theatrical as in a propaganda poster, but a more natural approach to the scene is probably more appealing. 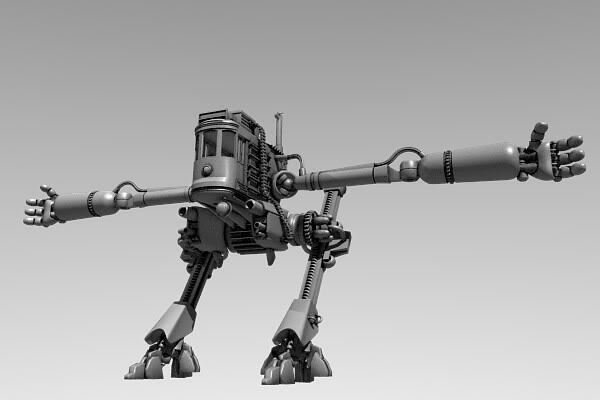 The original concept was a time saving shortcut to avoid modelling the whole mech (so it was laying on its chest) but I later got carried away and did the whole thing, and with tall legs! This makes for a difficult scene, large robot and small guy. Indeed, scales are tweaked a bit to remedy this (cheating…:no: ). I guess it’s an autonomous robot, the poses suggest a strong personality ;). Some smoke and volumetric lights maybe? I think this is one scene which would benefit greatly from a more close up, wide angled lens. The scene you produced for the contest is a case of trying to include everything and ending up leaving so much out. The best details are on the mech’s body and arms, and the character, so crop everything else away and use a close up, maybe with some of the building in the background with a very small amount of depth of field to blur out the background and any foreground an really bring the figures in to focus. The model, textures and rigs are great. I’m still aspiring to such levels. Thats a great work! the character and the robot have life, its a very nice render!